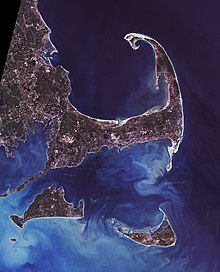 Cape Cod extends 65 miles (105 km) into the Atlantic Ocean, with a breadth of between 1–20 miles (1.6–32.2 km), and covers more than 400 miles (640 km) of shoreline. Its elevation ranges from 306 feet (93 m) at its highest point, at the top of Pine Hill, in the Bourne portion of Joint Base Cape Cod, down to sea level. Cape Cod's climate is also known for a delayed spring season, being surrounded by an ocean which is still cold from the winter; however, it is also known for an exceptionally mild fall season (Indian summer), thanks to the ocean remaining warm from the summer. The highest temperature ever recorded on Cape Cod was 104 °F (40 °C) in Provincetown, and the lowest temperature ever was −12 °F (−24 °C) in Barnstable. 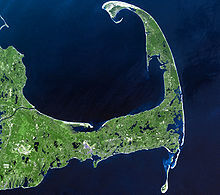 The band Vampire Weekend's self-titled LP contains two songs mentioning Cape Cod, "Cape Cod Kwassa Kwassa" and "Walcott". ^ a b United States Coast Guard. "Local Cape Cod Information". 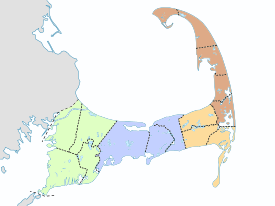 ^ "The Cape Cod Commission Act". Cape Cod Commission. 1989. Retrieved 5 March 2014. ^ "Census: Cape Cod losing population - News - capecodtimes.com - Hyannis, MA". Capecodtimes.com. 2011-03-23. Retrieved 2016-05-13. 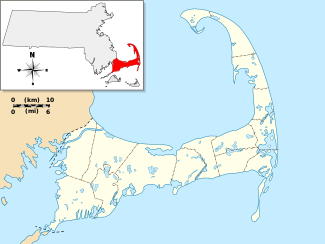 ^ "Barnstable County Massachusetts QuickFacts from the US Census Bureau". Quickfacts.census.gov. Archived from the original on July 6, 2011. Retrieved 2016-05-13. ^ Cape Cod Commission. "Comprehensive Economic Development Strategy (CEDS)". Archived from the original on March 26, 2010. Retrieved May 17, 2010. ^ "The Opening of the Cape Cod Canal". Bulletin of the American Geographical Society. Bulletin of the American Geographical Society. 46 (11): 832–834. 1914. doi:10.2307/200951. JSTOR 200951. ^ a b "Forms of Municipal Government for each community in Massachusetts". Massachusetts Municipal Association. July 2011. Archived from the original (PDF) on June 15, 2013. Retrieved May 6, 2013. ^ "Dates of Incorporation and/or Establishing City Form of Government". Massachusetts Department of Housing and Community Development. November 13, 2008. Archived from the original (PDF) on October 4, 2013. Retrieved May 6, 2013. ^ "Aptucxet Trading Post Museum |". Bournehistoricalsociety.org. Archived from the original on August 31, 2013. Retrieved May 13, 2016. ^ Brigham (1920), p. 132. 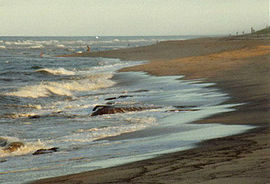 ^ "Provincetown Spit, Cape Cod, Massachusetts". NASA Earth Observatory. Archived from the original on September 30, 2006. Retrieved May 2, 2006. 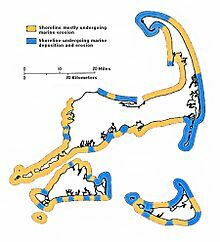 ^ Oldale, Robert N. "Coastal Erosion on Cape Cod: Some Questions and Answers". WoodsHole.er.usgs.gov. Retrieved November 30, 2007. ^ "Water Research". July 30, 2013. ^ "Provincetown, Massachusetts Travel Weather Averages". Weatherbase. Retrieved 2016-05-13. ^ "Yarmouth, Massachusetts Travel Weather Averages". Weatherbase. Retrieved 2016-05-13. ^ National Arboretum – USDA Plant Hardiness Zone Map Archived July 9, 2012, at WebCite. Usna.usda.gov (January 24, 2012). ^ "General Climate Summary Tables". Western Regional Climate Center. Retrieved February 19, 2013. ^ Stephanie Vosk (May 25, 2007). "Wampanoag tribe wins recognition". Cape Cod Times. Archived from the original on September 28, 2007. Retrieved June 5, 2007. ^ "Aptucxet Trading Post, Bourne Historical Society, Bourne, Cape Cod, MA". Bourne Historical Society. Archived from the original on March 19, 2011. Retrieved February 27, 2011. ^ "The Norse Wall House on Wikimapia". Retrieved February 13, 2007. ^ "The Norse Wall". capelinks.com. Retrieved February 13, 2007. ^ Jennings, Herman A. (1890). Provincetown, or, odds and ends from the tip end. Yarmouthport, Massachusetts: F. Hallett, Printer. pp. 9–14. ^ Baer, Chris. "HISTORY OF MARTHA'S VINEYARD". Historical Records of Dukes County, Massachusetts. Retrieved June 27, 2009. ^ David J. Weber (1992). The Spanish frontier in North America. Yale University Press. p. 36. ISBN 978-0-300-05917-5. Retrieved March 18, 2012. ^ Thoreau, Henry David (1865). "Cape Cod". Retrieved May 3, 2009. ^ "Public comforts 6-foot-long blue shark stranded on a Cape Cod beach". Boston.com. Retrieved 2015-11-18. ^ "Long Point, MA". LighthouseFriends.com. Retrieved 15 February 2014. ^ "Nauset Light Preservation Society". Nauset Light. Nauset Light Preservation Society. Archived from the original on July 10, 2016. Retrieved March 29, 2017. ^ "Lighthouse Moves – Cape Cod National Seashore". National Park Service. Retrieved 30 January 2013. ^ Kolleth, Michael (May 29, 1988). "Daily Rail Service to Cape is Returning". The New York Times. ^ "Bourne Bridge (MA 28)". Bostonroads.com. Retrieved 2016-05-13. ^ "Cape Cod : Bike trails, safety tips, and guidelines" (PDF). Nps.gov. Retrieved 2016-05-13. ^ "Road Cycling, Off Road Riding, ATB, MTB, Biking, Bicycle Trails On-road and Off-road". Cape Cod Bike Guide. Retrieved 2016-05-13. ^ "BSU Cape Cod | Bridgewater State University". Bridgew.edu. Retrieved 2016-05-13. ^ Dicum, Gregory (10 Aug 2008). "Cape Cod, in Edward Hopper's Light". The New York Times. ^ "Keep the sand in your shoes all year long". Capeandislandsplate.com. Retrieved 2016-05-13. Brigham, Albert Perry (1920). Cape Cod and the Old Colony. New York: G.P. Putnam's Sons. Cape Cod Commission Transportation Staff (May 20, 2013). Cape Cod 2012 Regional Transportation Plan (PDF). Cape Cod Metropolitan Planning Organization. Ripley, George; Dana, Charles A., eds. (1879). "Cape Cod" . The American Cyclopædia.